OK, this isn’t perfect, I’m not the best artist, but here’s a basic concept of what I am thinking about doing for my canoe. The top illustration is just the canoe with the outriggers. The outriggers themselves are dirt simple to understand. I figure two long aluminum tubes front and back, with 90 degree elbow joints at the end connected to some closed-cell foam elliptical floats. The aluminum tubes will be clamped, or even bolted, to the canoe gunwales. That means there would be aluminum poles going across the canoe, but nothing’s perfect. For simple stability that’s really all there is. It’s essentially a basic outrigger. But the bottom illustration shows one thing you could do with the outriggers. This is just a simple set of thin wooden planks to create platforms port, starboard and amidships. Those platforms should be strong enough to hold people, meaning that you could relax on the platforms, or even stand on them to fish. The whole thing should be simple to assemble, carry and attach, so the canoe could be used with or without the outriggers on a whim. The only problem is that once you are in the water, you can’t really reconfigure the canoe until you get back to shore. 9 users commented in " Canoe mods… "
My first thought is why didn’t you just buy a bass boat that would give you the stability/functionality you want to now add to your canoe. But I think I know the answer to that question. Second: I would make this system as portable as possible meaning I would not attach the tubes permanently to the gunwales. I would make it a priority to create a system that can be attached and unattached (clamps sound good to me) on a whim, as you say. And it would be nice to be able to reconfigure the canoe even if you’re already out on the water. Third: I wonder if you could make the tubes telescoping somehow. It would make the system more portable and perhaps make it feasible to configure/reconfigure out on the water. Hmm… I like the telescoping poles idea. Yeah, the answer to “why didn’t I just buy a bass boat?” is that the canoe, with all the accessories so far, cost me just over $800. A decent used bass boat runs from around $8,000 up. New bass boats are typically in the $14,000 range and up. Besides, this isn’t really attempting to replace a bass boat, it’s just trying to make the canoe a bit more versatile and flexible. Yes, the outriggers and other accessories are intended to be quickly and easily attached and removed. Even with bolts that’s not that big of a deal, but clamps would be quicker. The question is whether clamps would be as secure as needed. There are some commercial outrigger systems similar to this, and some are clamped, some are bolted. But the lowest cost version I’ve seen is $500 and that version appeared to me to be barely functional. jsullins… testing on scale models is not a bad idea, but frankly I consider this to be well understood engineering. Outriggers have been used for thousands of years. How large do I need to make the outrigger floats so that they don’t simply get pushed underwater, while still having them be small and thin enough that they don’t interfere much with the canoe’s propulsion? What is the best way to ensure the proper vertical placement of the floats so that they don’t just slap up and down on the water, or put too much stress on the gunwales of the canoe? Should I have an adjustable vertical placement? If so, what’s the best way to design that? What is the best way to attach the crossbars to the canoe? Should I reinforce the canoe gunwales somehow? If so how? I figure I can look at existing commercial models to get a good idea of how to solve the size of the float issue. Since foam is so light I think it is not a big deal to err on the side of “bigger”, so long as they remain thin enough to not add too much to the canoe’s drag. The second I think could be pretty easily dealt with using a slot and wingnut approach. So the biggest issue is the attachment to the gunwales. If anything is going to damage the canoe, it is going to be stress on the canoe from the weight or flexing of the outriggers. This is the thing I have the least intuitive feel for, and I don’t believe a scale model will help to solve since the forces involved don’t scale linearly, nor do the strengths of materials I would use in a model. The best approach is probably to over-engineer it, perhaps by attaching some reinforcing wood or metal strips to the gunwales so that the stress is spread across a wide section of the canoe instead of just at the points of attachment. The commercial versions I’ve seen don’t do that though, they seem to just attach right to the gunwales… So maybe I’m overly concerned about this piece. That’s another good idea Dadman. There are some “do it yourself” mods I’ve found on the web that use PVC pipe for this purpose. One uses swimming pool noodle toys for the outrigger floats. I could take some thin steel bars and bend them so they fit the gunwales, then epoxy them in place. Then I could drill through the bars and gunwales to attach the crossbars. That should give much more strength than needed, and the steel bar should distribute any stress along two or three feet of gunwale. If epoxy won’t do it, I could always bolt the bars down. It seems to be completely doable. The trick is to get the right materials. I’ll start with some 3/4 ” and 1″ aluminum tubing. The 3/4″ will slide inside the 1″, allowing the arms to telescope so I can extend or retract the floats. That would make it easier to pull up next to a dock or another boat. The canoe is 42″ wide at the middle, where I would be likely to connect the arms. So if I make the 1″ pieces 48″ long, then that would extend slightly past the edge of the canoe, allowng me to clamp it to the gunwale. There are some clamps that are made for this sort of thing that I can buy at specialty clamp stores. If I can’t find the clamps, I can just drill holes and use a “C clamp” to bolt them down. I’d prefer not to drill holes in the gunwales, but that’s probably a more secure way to do it anyway. Then I can insert 30″ smaller square aluminum rods into the clamped ones to form the arms. To hold them in place all I need to do is drill some holes and use a bolt or even a cotter pin to push through the holes. Depending on where I drill the holes, I could set the floats at anything from right next to the canoe to two feet out for maximum stability and platform width. I’ve seen a number of ways to make the floats, including filling large PVC pipes with closed cell foam. It should be possible to simply drill holes and bolt them to small sections of the aluminum tubing, and seal that up with epoxy or something so it doesn’t leak. Now the only thing left is to figure out how to connect the floats to the arms such that I can adjust their height. That means connecting two square tubes together. The ideal way to do that would be to use a 1″ T-joint square tube. That would allow me to connect the “tail” of the T to the arms, and then the crossbar of the T could allow the float tubes to slide up and down, allowing me to connect them at whatever height I wanted. This will totally work. If I had the tubing and PVC pipe, I’d start on it this weekend. Sounds like a trip to Home Depot is in order. I figure the full cost of this will be in the range of $150 or so. This is totally doable. Totally. 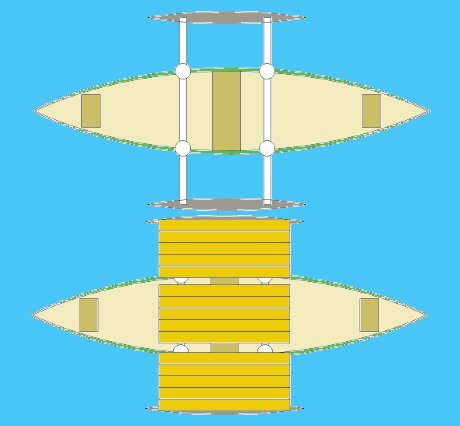 It’s been awhile since posting this canoe outrigger and deck concept, any new thoughts, or progress, gone into the build? I’m wanting to do almost the exact same thing to my 17′ aluminum Grummman. Really really rough drawings, not meant for public consumption. Jerry, I get a “private album” message when clicking that link. I went back and forth on this thing in my head for months, and I finally decided that the key to this would be what you use for the outrigger float. None of the PVC, styrofoam or even plastic balloon options I considered seemed to be better than either a large surfboard or even a small kayak. I tried to find a used surfboard, but since I live over a thousand miles from the nearest surf, that didn’t actually work out. Right now I have this on hold (along with dozens of other projects) while we fix up our house and try to sell it. I’ll probably revisit this next summer. The kayak option is what I really ended up giving the most thought. Used kayaks with minor damage that would not affect my purpose aren’t that hard to find.